"March 31, 1937 - Blueprint - Engineering Dept. Organization Chart - San Antonio Air Depot - Air Corps - Duncan Field - San Antonio, Texas." (1026) March 31, 1937 - Blueprint - Engineering Dept. Organization Chart - San Antonio Air Depot - Air Corps - Duncan Field - San Antonio, Texas.- Condition: Very Good This is a rare piece of Historic Information. This Blueprint unfolds to measure 19" by 22". It is on the heavy blue blueprint paper. The title is " The Engineering Department - 4 Military Officers". This Blueprint lists all of the Departments in this area and the cost (perhaps of building or maintaining) each. Departments are broken down into sub-headings. Some of the Departments include: Aero Repair Branch, Accounting, Dismantling and Cleaning, Fuselage Prelim Assembly, Sheet Metal, Parachute Branch and many many more. There are a few spots on what was the outside section when folded. 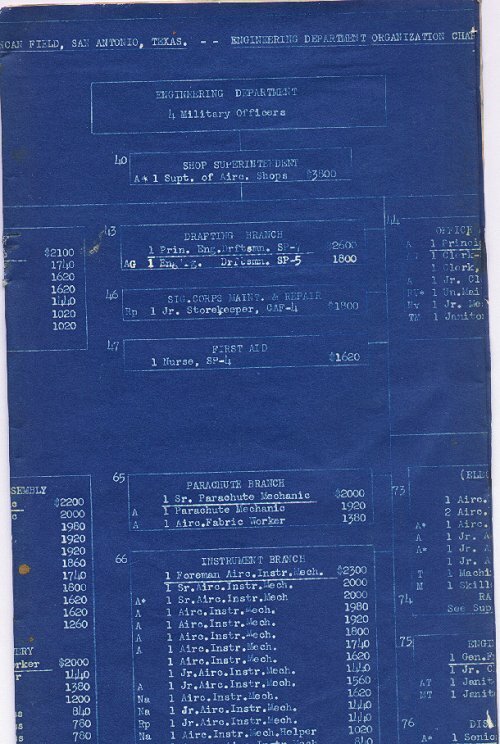 The rest of the blueprint is in wonderful condition. See Number 1027 for another Blueprint!. Price: $22.00 + Shipping.